Kamala Beach Hotel, Phuket ... Perfect sunsets and unspoiled tropical beach cascading mountains are some of the highlights that make Kamala Beach Hotel unique. Surrounded by the swaying palms you will find your own Phuket paradise at the Kamala Beach Hotel. 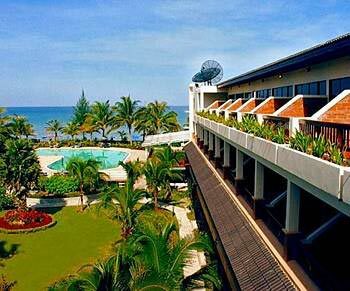 Kamala Beach Hotel is located in the heart of Kamala beach, on the west side of Phuket island. There is no road going across in between the hotel and the beach. The hotel is easily accessible from the airport, all major beaches and the tourist destinations, just 4 kilometers from Patong beach, and only 35 minutes from Phuket airport. Kamala Beach Hotel offers a choice of 200 tastefully decorated superior rooms. Each superior room is equipped with air-conditioning, mini-bar, Telephone, TV, safety box (in some rooms), private balcony and seperated bahtroom with bathtub and hot/cold water.